For the Cyclones, wrestling isn't just a sport. It's a legacy. Iowa State University has its rich history of agriculture to thank for having one of the college scene’s cleanest diets. A nearby farm, AG450, is the nation’s only student-managed farm at a land-grant college. Farmer or not, student dining options are sourced from 35 local farms. SEE ALSO: Is OSU America's Healthiest Campus? On the fitness front, ISU has a plethora of sports facilities: two climbing walls, more than 20 basketball courts, and a variety of outdoor sports equipment from kayaks to bicycles. 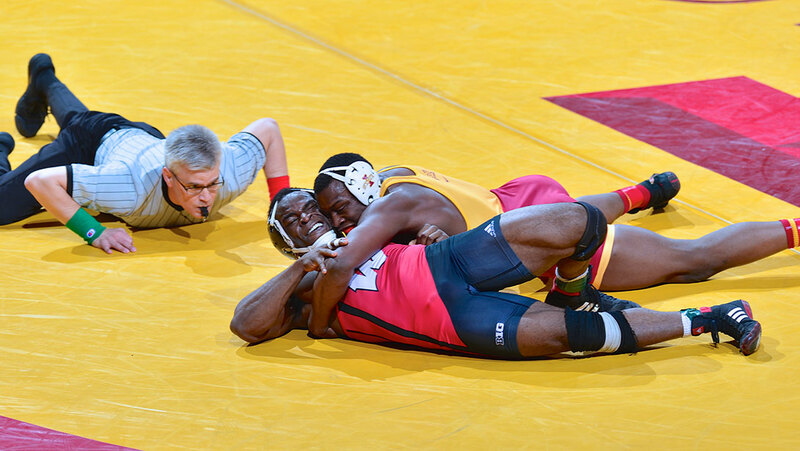 But at ISU, one activity is truly king: wrestling. ISU’s wrestling program became the first to reach 1,000 dual wins in 2010, and it has won eight NCAA national championships. To cement their own legacy, today’s ISU wrestlers practice four days a week and lift three to five days a week in one of the school’s three weight rooms. Think your college is fit enough for an M&F feature? Tweet us using #CollegeMuscle to join the conversation. If you make a good enough case, you might see your college in our next issue!